Dr. Flora Farago, assistant professor in Stephen F. Austin State University's human development and family studies program, helped launch a U.S.-based nonprofit organization, Friends of the Girl Child Network, which provides resources to the Girl Child Network in Kenya. During the summer, Farago traveled to Kenya to work with GCN and lay the groundwork for Friends of the Girl Child Network. 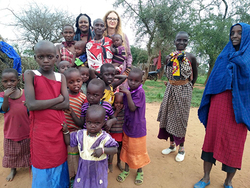 NACOGDOCHES, Texas - On a recent trip to Arizona, Dr. Flora Farago, assistant professor in Stephen F. Austin State University's human development and family studies program, officially began an organization that will help girls thousands of miles away in Kenya. Farago and her colleagues Mercy Musomi, executive director of the Girl Child Network; Drs. Beth Swadener and Heather Switzer, professors at Arizona State University; and Sarah Davis, volunteer and former intern for the GCN, launched the U.S.-based nonprofit organization Friends of the Girl Child Network. This organization provides resources to the GCN in Kenya to support and expand its operations and work on issues of gender justice. The GCN is an organization advocating for the education and rights of women and girls in Kenya. GCN deals with social issues, such as child marriage and female education. "Women and girls, both within the U.S. and across the world, still face significant disadvantages and sexism," Farago said. "GCN works on many fronts to eliminate child marriage and female genital cutting and ensure that girls stay in school. Our organization will allow GCN to expand its programming and support a larger number of girls across initiatives." According to the organization's website, Friends of the Girl Child Network members provide sponsorships for girls to attend school and promote community education to address the issues keeping girls from becoming successful adults. Sponsorship helps combat abusive homes, harmful cultural practices, poverty and discrimination. "I feel it is critical to do what we can in our own spheres of influence to spread and allocate resources in an unfair world," Farago said. "With Friends of the Girl Child Network, I have an opportunity to pay things forward, to spread the wealth and to assist channeling resources to GCN in Kenya that directly lift up women and girls." For three weeks this summer Farago worked in Kenya to help lay the groundwork for launching Friends of the Girl Child Network. This is her second trip to Kenya. Farago and her colleagues delivered donations, including children's books, toys, and adult and children's clothing to GCN. SFA faculty and staff, Nacogdoches community members, the NAACP Nacogdoches Chapter, members of the Organization of Faith, Education and Community, local churches, and the Nacogdoches Public Library supplied many of the donations. Learn more about how you can become involved with Friends of the Girl Child Network by contacting Farago at faragof@sfasu.edu, or visit friendsofthegirl.org.